MacDonald Ranch 1,200 acre master-planned community is a premier residential development in Henderson, Nevada that offers residences an enhanced lifestyle with daily conveniences to activities for all ages. 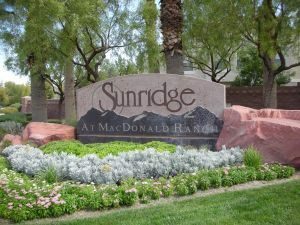 MacDonald Ranch homes for sale offers something for every budget and lifestyle within the three popular communities MacDonald Highlands, Sun City MacDonald Ranch, and Sunridge Heights. Many homes in all neighborhoods offer great views of the valley and the Las Vegas Strip. MacDonald Ranch homes for sale are in 89012 Zip Code. Sunridge Heights offer moderately priced homes with great community amenities. Residence can take advantage of the great walking trails and community parks. MacDonald Highlands is a high-end luxury residential home subdivision that is guard gated and offers a premier country club. Though the price reflects the great quality of homes and large lot sizes, you can find just about anything you are seeking with the right budget. If you are a golfer you could own a semi-custom home on Dragon Ridge golf course. If you are looking for a great age restricted community then consider Sun City MacDonald Ranch. This community offer a very active adult lifestyle with resorts style pools, recreational centers, planned events, and plenty of sports.